Maca strengthens and balances the endocrine system of both sexes. Its action focuses on the hypothalamus/pituitary axis, which in turn governs the intricate hormonal (endocrine) system of the body. Not only can the reproductive system be re-energized by Maca, but the thyroid, parathyroid, pancreas and the adrenal glands also benefit by becoming balanced and stronger as it reaps the benefits of excellent glandular nutrition. Maca can help relieve symptoms such as infertility, frigidity, PMS and menopausal hot flashes all in a safe, effective and natural way. Maca is a powerful adaptogen, meaning it helps us deal with stress. Supports adrenal function. Excellent for adrenal exhaustion and fatigue. 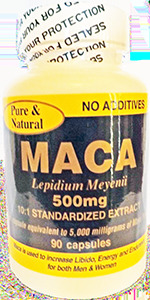 Maca is used for sexual dysfunction and as an aphrodisiac in both men and women. Both men and women use to increase mental clarity. Women use it to control hot flashes and other menopausal symptoms.